You know this thing about Fangbone Games? In the Fangbone Games category you will be playing many interesting games with Fangbone, who is a nine-year old warrior who finds himself in a new world, in that of a third grade class in an Elementary School. Together with his new friend Bill, Fangbone will have to tackle this new world, and you can help him with that by playing the great Fangbone Games on our website! In Fangbone Games you can find 4 games that we've published for these kids and childrens that are interested to play Fangbone Games, this game gategory have been created on 09.05.2016. These games with Fangbone Games have been voted 1 times and the avarage of vote is 5.00 stars. We advice you to play the last flash game from Fangbone Games, Fangbone Memory Cards that have been published on 23.04.2017 20:01. Fangbone Coloring its a part of Fangbone Games category and until now its played 990 times. Try it now on Cute-Games.com! If your like the Fangbone Coloring game you can write a comment in the game page. Recommend this game to your friends if you like it! Fangbone Puzzle its a part of Fangbone Games category and until now its played 902 times. Try it now on Cute-Games.com! If your like the Fangbone Puzzle game you can write a comment in the game page. Recommend this game to your friends if you like it! Fangbone Memory its a part of Fangbone Games category and until now its played 764 times. Try it now on Cute-Games.com! If your like the Fangbone Memory game you can write a comment in the game page. Recommend this game to your friends if you like it! Find More About Fangbone Games! A new Disney XD Games category has been created for you on www.cute-games.com, which is the Fangbone Games category, a category which we are very proud about and very excited for, because we know how much fun the games in the Fangbone Games category will be, just as fun as the show is. 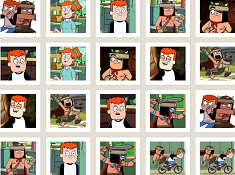 While the show has not started airing yet in the United States, until the 28th of May, it has started airing already in Canada, and we can assure you, from the episodes that we have seen, you are going to love the show, but more importantly, you are definitely going to love playing Fangbone Games, only here, on www.cute-games.com! The story of Fangbone will be a very interesting and sweet one, and we are sure you will enjoy seeing his antics on screen. That is because Fangbone will be an outsider in a brand new world for him, and will have to get used to this new life, to new people, to a new environment, that is extremely different from the one he is used to. Like you may have already guessed by the title character's name, Fangbone is not your regular American boy, because he comes from Skullbania, a country which is very different from ours, with a totally new culture and traditions. 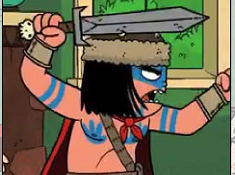 While regular nine-year old kids are going to school, learning new things about the world, and having fun and doing normal kid's stuff, Fangbone is a barbarian warrior. Since his birth, he has been trained to be a soldier, so the fact that he has came to the Eastwood Elementary's third grade will be a very big change for him, but also for the kids he will meet in this class. Curious about the Fangbone Games already, right? Well, we told you that the premise of this show is a very interesting one, and that this is a must see cartoon! Fangbone has come to this new land for him because he wants to protect his native land from the villain known as Venomous Drool. Of course, Fangbone will not be alone in his quest, but instead be assisted by the new friend he made in the class, a regular kid called Bill, who becomes a sidekick for Fangbone. Fangbone must do his best to stop the villain, while learning new things about this world that he now finds himself in, and also, trying to get rid of habbits which might seem normal to him, but not to the people around him. Like having a spear with him. 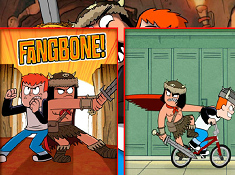 As you can see, Fangbone will get into all sorts of situations, and you won't be bored one second, whether we are talking about the show, or the Fangbone Games on our website! 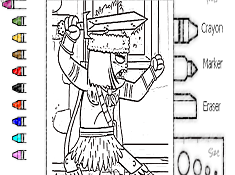 In what kinds of situations will Fangbone find himself in? Well, he will find a Skullbanian clan hidden in plain sight on Earth pretending to be reenactors of medieval times, he and Bill go through a portal into another world, or Bill get himself a spirit beast companion. Sounds really fun, right? Well, the more reason for you to play the wonderful Fangbone Games which you can find on our website! Other characters which you will be able to see in the show but also maybe encounter while playing Fangbone Games could be Ms. Gillian, who si the teacher of the class Fangbone is in, or Bill's mom, who is one of the kindest moms ever, always there to help out her son and his friend Fangbone. We will always be on the lookout for all the new Fangbone Games on the internet, so that we can be the first site to offer them to you. Of course, since the show is at it's beginning, you can't expect to have a large number of Fangbone Games already, but, as the show keeps airing and grows a fanbase, we are sure that new Fangbone Games will start popping up weekly, and you will enjoy playing them on our website, for sure! So far, you will be able to solve some puzzle games with Fangbone, to get your creative and artistic juices flowing by playing coloring games in which you paint the characters however you see fit, or you can test your visual memory with a memory matching game. These, and many others, only in the Fangbone Games category on www.cute-games.com! Well, with this description we hope that we have got you excited for the Fangbone Games category, and that as soon as you are done reading, you will start playing these great games which you can find easily, just by scrolling upwards on this page. Remember, that if you want to play new Fangbone Games at any time, just visit our website, and also, don't forget to also invite your friends on our website, so that they can also find the latest Fangbone Games on the internet, and not only, here on our website!